Filled mochi cakes were my first encounter with this delicious, goopey rice cake about two decades ago. The mochi cake had sweetened red bean tucked inside. It was love at first bite and while Koreans are no strangers to rice cakes, it was the soft texture that made it more enjoyable to eat than Korean dduk (rice cakes). 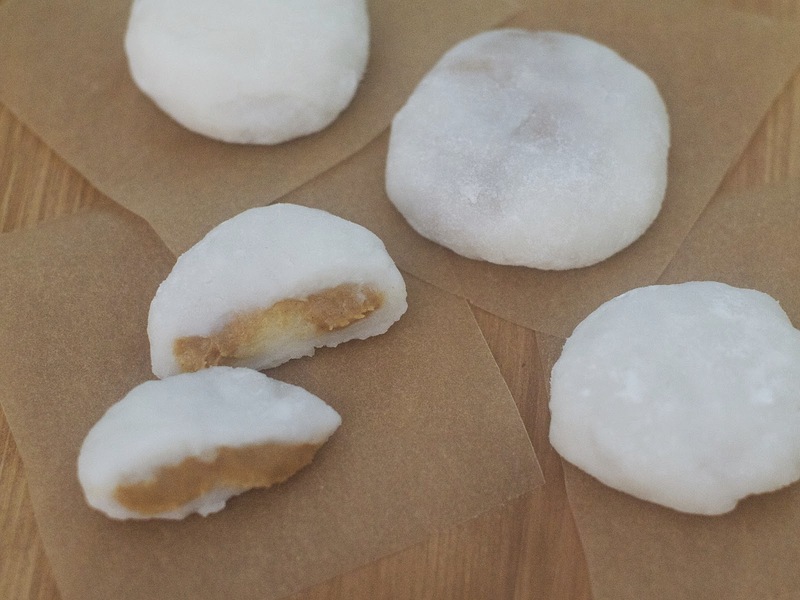 Since I have been exploring the many creations that one can make from a box of Mochiko, I decided it was finally time to try making my own mochi cakes. I was also inspired by this photo on Instagram. It's fairly easy, just kind of messy. Since no baking is involved, it's a quick process once you have a filling made. I went with peanut butter since it was already in my cupboard but nutella and red bean are other delicious options. I sweetened the peanut butter to make it taste more like Reese's peanut butter. The result: delicious! A quick tip for assembling: When stretching out the mochi after the initial flattening, I found it best to flatten the edges to spread it out so the middle didn't become too thin (a thin middle caused the filling to poke out of the mochi). 1. Combine peanut butter, honey and powdered sugar together until mixed well. Refrigerate for 3 hours or overnight until firm. 2. Flour a cutting board with extra rice flour. Boil water and then add sugar and mix until dissolved. Add in rice flour and mix fast to prevent lumps. The mixture will thicken quickly. Transfer mochi onto floured surface. 3. 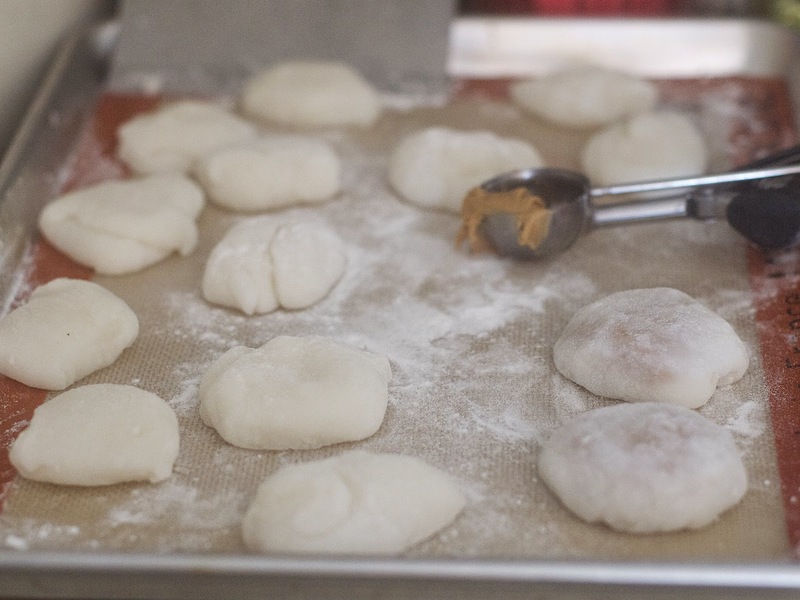 Let mochi cool for a few minutes then knead, if sticky, add more flour or even with a little powdered sugar. Cut dough into 15 equal pieces. 4. Take one piece, roll into a ball and flatten ball. If a little too thick, stretch out disc on the outer part of circle. 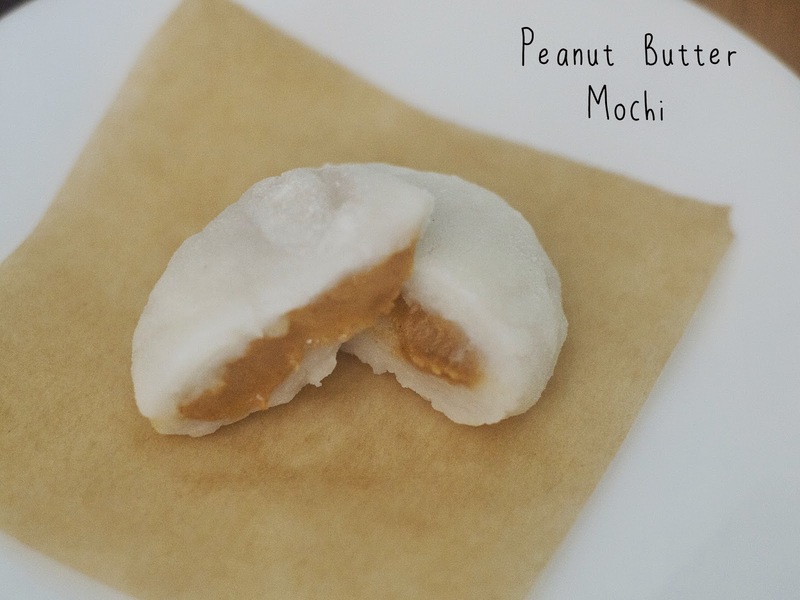 Add in a tbs of firmed peanut butter and then seal mochi by bringing in outer edges to the center over peanut butter and pinching to seal. Repeat with remaining mochi pieces.